Ever since Satan set his will against God, to usurp the throne of God, he has been trying to hinder and pervert the worship and prayers of God’s believers. When we worship the true God, therefore, he hates it, and he will do everything possible to hinder and pervert our prayers. What he likes to do and what he has been doing for centuries is to put before the Christian a more exciting way to pray. He has managed to draw many weak believers into praying wrongly, using practices that are perhaps more exciting, and that produce peaceful and happy sensations, and that appear to be Christian, but are not Biblical and are harmful to their faith. Accordingly, Satan and his demons come to us as angels of light (2 Cor. 11:14); hence, the kind of prayer and worship he puts before us is nothing but a counterfeit or an imitation of true prayer. The kind of prayer I am mainly talking about has been termed contemplative prayer. It is a type of prayer that I believe is an invention of the devil to keep the church from true and correct prayer, and therefore, from following God’s will and from enjoying true intimacy with Him. Sadly, many weak believers have been deceived and have fallen prey to this kind of prayer. I will talk more about contemplative prayer shortly [in an up coming post], but before that I want to give you the basis of it and where it came from. I believe the devil has been thinking about contemplative prayer and perfecting it for centuries. The roots of this kind of prayer, which some see as kind of a New Age/ Christian type of prayer (an oxymoron), are clearly in the Eastern religions and also in Satanism and the Occult. We will discuss these as the devil’s servants, because that is what they are. They are what the devil has used and uses to attract us, to pervert our prayers and to ultimately draw us into his realm where he will make us suffer and make us useless for the kingdom of God. The next post will be about the devil’s servants—seven of them. This post is an excerpt from my book Joy of Prayer. 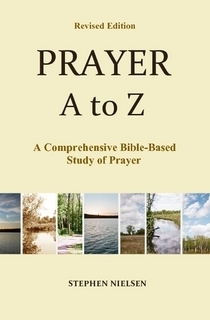 This entry was posted in Part 4, How the Devil Tries To Pervert Our Prayers, Prayer A to Z Excerpts, Quietness in Prayer and tagged prayer, Satan. Bookmark the permalink.